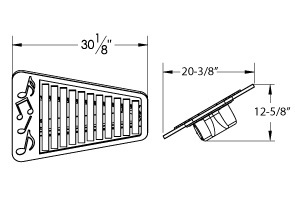 The Jill marimba allows both musicians and non-musicians alike the opportunity to engage in artistic exploration and creative play. Jill provides 11 easy, ready to play fiberglass keys that are expressly engineered to produce always in-tune notes that radiate rich, earthy tones. 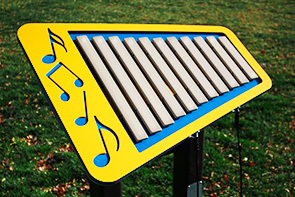 Utilizing a straightforward design and components constructed highly-durable materials, this outdoor musical instrument delivers long-lasting, inclusive enjoyment to a variety of environments. 2 attached mallets included. Jill performs well on her own and perfectly pairs with Jack Metallophone.